It has been something of a wait, but Beequeen has opened up their Vaults once more. After the succesful release of A Touch Of Brimstone in 2003, we now very proudly present SELTENTURM - BEESIDES (1989-2000). This brand new collection takes in many previously released but now unobtainable Beesides in the double CD format. A treasure-trove of the past! While Beequeen recently finished recording 'Sanddancing' (their next excursion into the world popmusic - a journey beginning with 'Ownliness' and 'The Bodyshop'), which will be released early 2008 by Important Records, it was time to clear out the vaults; and this time for good. While 'A Touch Of Brimstone' saw the release of many unreleased pieces from the archive, 'Seeltenturm - The Beesides' takes a good look at the released output from Beequeen, ever since they started to release music in 1989. 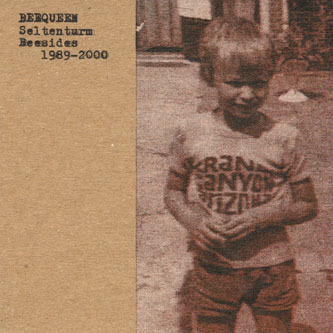 SELTENTURM (a fine double CD) consists of the following releases: 'Mappa Mundi' (cassette, with bonus tracks), 'Fond' (one sided LP), 'Split' (split LP), 'The Surrough Gate' (10"), 'Vault' (7"), 'White Tusk' (7") and 'Dovidzdane Vanja' (7"). All of these releases were made in editions smaller than 250 copies, and all long out of print. All tracks have been lovingely remastered by Raymond Steeg in the warm winter of 2006-2007 and they have never sounded better. A real treasure box for old and new fans alike. Limited edition of 300 copies in gorgeous printed artwork. Design by Meeuw. analogue bubbles. "Dovidzdane Vanja", which means "The Death Of Beequeen", was a 7" out in 2000 that is the farewell to their melanchonic soundscapes. (The duo recorded many other dronework s under the name Wander - http://www.beequeen.nl/wander.htm ). This awesome collection is both the best starting point for the new listeners that want to know about the more experimental side of Beequeen and absolutely necessary for completists. Ltd Edition of 300.